Dr. Lonsberry obtained his Optometry degree from the University of Waterloo in 1996 after completing a Master of Science in Physiology from the University of Manitoba. He completed his residency in Primary Care Optometry from the Illinois College of Optometry in 1997, then joined the faculty at Southern College of Optometry in Memphis, TN. During his time at SCO, he completed a Masters in Education degree with an emphasis in adult learning. Currently, Dr. Lonsberry is a Full Professor with Pacific University College of Optometry in Oregon. Dr. Lonsberry is a Diplomate of the American Board of Optometry, a Fellow of the American Academy of Optometry, the Optometric Retinal Society, the Optometric Glaucoma Society, and the Ocular Surface Society of Optometry. Dr. Spear completed his undergraduate education at Western Kentucky University and is a 1991 graduate of the University Of Alabama School Of Optometry at Birmingham. Additionally, Dr. Spear completed a Residency in Primary Care Optometry/Ocular Disease at Northeastern State University College of Optometry, in Tahlequah Oklahoma and a Master’s in Business Administration at Auburn University. - Assistant Professor of Optometry at Northeastern State University College of Optometry where he taught courses in laser therapy, systemic medications, and advanced therapeutic and diagnostic clinical procedures. Currently, Dr. Spear and his wife Dr. Katie Gilbert Spear practice in a multi-location private group optometry/ophthalmology practice in the Panhandle of Florida. In addition to lecturing, writing and consulting, Dr. Spear is also a member of the Florida Board of Optometry, Commander of the 919th Special Operations Medical Squadron at Duke Field, Florida, Chairman American Academy of Optometry Exhibits Committee and an active member of The American Optometric Association and the Florida Optometric Association. Dr. Jasper is in private group practice in WPB, FL. She graduated from Nova Southeastern University College of Optometry with highest honors. She has authored numerous publications and currently serves as professional co-editor of Women in Optometry magazine. She served her colleagues as past president of the Florida Optometric Association 2016-2017 and lectures all over the country on several topics including contact lenses, ocular disease and practice management. Dr. Nathan Lighthizer, O.D., F.A.A.O., is a graduate of Pacific University College of Optometry. Upon graduation, he completed a residency in Family Practice Optometry with an emphasis in Ocular Disease through Northeastern State University Oklahoma College of Optometry. Dr. Lighthizer has since joined the faculty at the Oklahoma College of Optometry and serves as the Chief of Specialty Care Clinics and the Chief of Electrodiagnostics Clinic. He was recently named the Director of Continuing Education as well as the Assistant Dean for Clinical Care Services at the Oklahoma College of Optometry. Dr. Lighthizer lectures nationally on numerous topics, most notably advanced ophthalmic procedures, electrodiagnostics, and ocular disease. 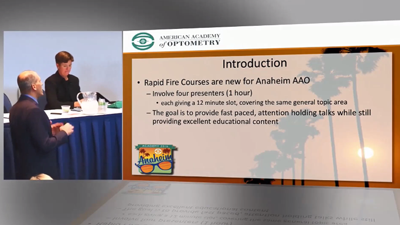 This interactive and rapid-fire course examines the use of oral and topical pharmaceuticals in the treatment/management of a variety of anterior segment diseases. Topical areas include HSV keratitis, herpes zoster ophthalmicus, bacterial/allergic conjunctivitis, lid/periocular tissues, uveitis and dry eye disease/Sjogrens. The course will provide an overview of a comprehensive-care approach to the adolescent patient with chronic post-concussive symptoms. This paradigm shift started with a multidisciplinary brain injury clinic at Boston Children’s Hospital established in July 2014 where patients with persistent symptoms after a concussion are seen. Each patient is examined by Sports Medicine/Neurology, Physical Therapy, Otolaryngology, Optometry, Ophthalmology, and Psychology on the same day, and a retrospective review of these individuals and their symptoms has shown relations among the visual symptoms and dysfunction across multiple physiologic systems. The data and a comprehensive view are presented herein. David Howell is a researcher at The Micheli Center for Sports Injury Prevention and Division of Sports Medicine at Boston Children’s Hospital. Primarily, his research investigates how gait and balance control are affected by concussion, and how objective and instrumented assessments of function can augment clinical evaluations and assist with return-to-play decisions. This one-hour lecture will present a rapid fire approach to the anterior segment. It will discuss the treatment and management options available for hyperacute gonococcal conjunctivitis, preseptal and orbital cellulitis, peripheral ulcerative keratitis (PUK), neurotrophic and Mooren’s ulcer. We will also explore the treatment options for inflammatory conditions using some of the newer biologic therapies in eyecare. These include amniotic membranes, autologous and umbilical serum, and topical compounded biologic agents, all while engaging the audience with clinical data, photos, video and case examples. Nicholas Colatrella, OD, FAAO, Dipl AAO is a residency trained optometrist, who is the medical director and owner of PineCone Vision Center in Sartell, MN. Dr. Colatrella is board certified by the American Board of Optometry and the American Board of Certification in Medical Optometry. Dr. Colatrella received his Bachelor of Science degree from Old Dominion University in Norfolk, VA, and his Doctor of Optometry with honors from the Illinois College of Optometry in Chicago. He completed his residency in ocular disease at the Veterans Administration Medical Center in Cleveland, Ohio and served as the director of operations at Northeast Ohio Eye Surgeons for 8 years. Dr. Colatrella is a fellow, and Anterior Segment Diplomate, in the American Academy of Optometry, past Chair of its disease section, and a founding chair of the Anterior Segment Section. He is a member of the American Optometric Association, Past President of the Minnesota Optometric Association and the Past President of Illinois College of Optometry Alumni Council. He has been published several times and lectures nationally on various topics including LASIK, cataracts, pharmacology, dry eye and corneal diseases. He is an adjunct professor for several Colleges of Optometry and routinely mentors optometry student externs. Dr. Colatrella has proudly accepted numerous awards and was honored to accept the “Young Optometrist of the Year” award both in Ohio and Minnesota. He was also acknowledged as one of Best and Brightest “Forty under 40” in the eye care industry by Vision Monday Magazine and humbly accepted the “Sartell Business of the Year” award. Dr. Colatrella enjoys his children, biking, running, tri /duathlons, fantasy football and home improvement. Dr. Varanelli is a 1998 graduate of the Illinois College of Optometry. Currently, Dr. Varanelli is an associate at the Simone Eye Center, where he specializes in comprehensive eye care, with an emphasis on the medical and surgical co-management of eye disease. Dr. Varanelli is a member of many local, state, and national societies, including the American Optometric Association and the Michigan Optometric Association, where he served on the Continuing Education Committee for 9 years. He currently serves on the Bylaws and Resolutions Committee, the Recruitment and Retention Committee, the Nominating Committee, and the Medicaid Committee. Dr. Varanelli is a Diplomate in the American Board of Optometry, as well as the American Board of Certification in Medical Optometry. He is a Fellow of the American Academy of Optometry, a founding member of the Academy’s Anterior Segment Section, and its Immediate Past Chair. He served as a Clinical Examiner for the National Board of Examiners in Optometry, is a past president of the Metropolitan Detroit Optometric Society, as well as a Past President of the Illinois College of Optometry Alumni Council. Dr. Varanelli has been a Clinical Associate Professor at the Michigan College of Optometry, and is a Course Reviewer for the Council on Optometric Practitioner Education. He is a published author and has lectured extensively to the optometric profession and to other health care workers and organizations. He is sought after to lecture on topics related to refractive surgery, anterior segment pathology, dry eye, pharmacology, and other eye care topics. He was awarded the Michigan Optometric Association’s Young Optometrist of the Year in 2004. Dr. Wilmer is the Associate Dean for Clinical Affairs and Clinical Professor at the UC Berkeley School of Optometry. She is the Director of Affiliate Residency Programs, which include residents from the San Francisco VAMC, Palo Alto VAMC, Reno VAMC and Fresno VAMC. Dr. Wilmer lectures locally, regionally and nationally on a number of clinical topics. Dr. Wilmer is the Chair of the Anterior Segment Section of the American Academy of Optometry. She is a member of the Part I Disease Examination Development Committee for the National Board of Examiners in Optometry. She serves the local medical community as a member of the Alta Bates Medical Center Ethics Committee. She was the 2010 recipient of the Roy Brandreth Excellence in Teaching Award and the 2011 recipient of the Bernie Dolan Resident Mentor of the Year Award. Dr. Mika Moy graduated from UC Berkeley School of Optometry and completed a residency in Pediatrics and Specialty Contact Lenses there. She is a Clinical Professor at the school and is instructor in charge of the Anterior Segment Disease course. Her primary responsibility is teaching third years, fourth years, and residents at the Tang Eye Center in the University Health Services. Dr. Moy lectures on a variety of topics nationally and internationally, but has a special interest in anterior segment disease and neuro-optometry. She is the Vice Chair of the Anterior Segment Section as well as a Founding Member. This course will be presented in a rapid fire format (using 4 different speakers sharing eight different topic areas) a wide array of topics dealing with recognizing and managing herpetic eye disease. A full discussion ranging from differentiating herpetic corneal lesions from other corneal lesions not related to herpetic diseases to managing the ravages of severe herpetic complications such as acute retinal necrosis, post-herpetic neuralgia and neurotrophic states.The importance and value of proper vaccination will be shared and some unusual case presentations will highlight the need for early recognition and when attention is needed relative to additional systemic concerns such as reduced cell mediated immunity.